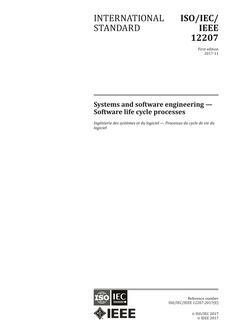 Establishes a common framework for software life cycle processes, with well-defined terminology, that can be referenced by the software industry. It contains processes, activities, and tasks that are to be applied during the acquisition of a software product or service and during the supply, development, operation, maintenance and disposal of software products. Software includes the software portion of firmware. Establishes a common framework for describing the life cycle of systems created by humans. It defines a set of processes and associated terminology. These processes can be applied at any level in the hierarchy of a system's structure. Selected sets of these processes can be applied throughout the life cycle for managing and performing the stages of a system's life cycle. This is accomplished through the involvement of all interested parties, with the ultimate goal of achieving customer satisfaction.